LA CROSSE, Wis. – The Gustavus women’s basketball team dropped a non-conference game to UW-La Crosse by a score of 55-49 on Thursday night. With the loss the Gusties fall to 3-3 while the Eagles move to 7-0. The undefeated Eagles came into the contest having defeated every opponent so far this season by at least 19 points and from the get-go the Gusties gave them a battle. Late in the first quarter, after UW-La Crosse gained a 13-9 lead, back-to-back baskets by Gabby Bowlin (So., Winona, Minn.) and Mia Wassink (Jr., Edgerton, Minn.) tied the game at 13 apiece. 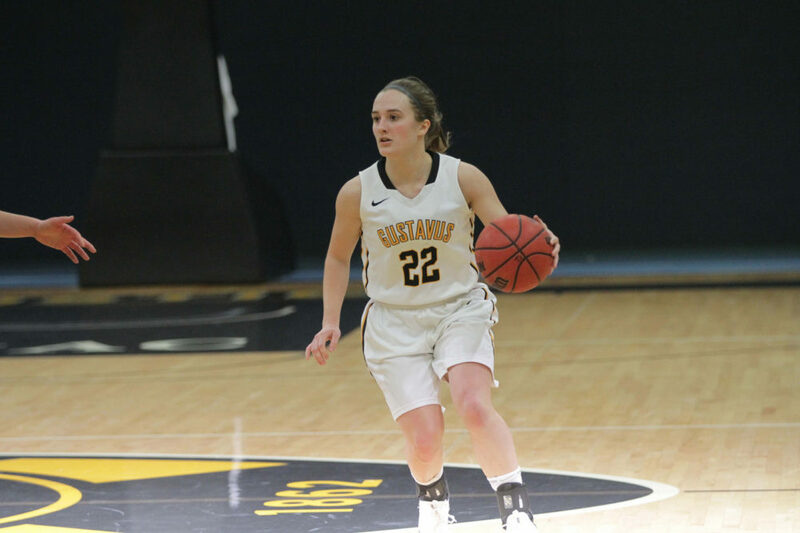 The Eagles would go on a run again in the second quarter and jump out to a double digit lead but Gustavus closed out the half on a 7-0 run to bring the game to 27-24 going into the break. In the third quarter, the Gusties shot their best field goal percentage for a quarter at 38.5 percent, but six turnovers doomed the visitors as the Eagles added onto their lead and brought it to 41-34 at the end of the quarter. In the fourth quarter, the Gusties would once again fight back. A Justine Lee (Sr., Dawson, Minn.) three-pointer with 7:07 left to play brought Gustavus within three points but the Eagles would push the lead right back to eight less than a minute and a half later. With 5:09 to play and trailing 40-48, the Gusties would go on a 7-2 run capped off by a Paige Richert (So., Comfrey, Minn.) layup to once again shrink the Eagles lead to three. That was as close as the Gusties would get though as the Eagles hit two key shots down the stretch to extend their lead and with Gustavus trailing by four with 1:09 remaining they would miss their final four shots of the game and the Eagles would take home the victory. In the contest, Kendall Thompson (Sr., Eden Prairie, Minn.) led all Gusties scoring 13 points to go along with four assists and four steals. Lee added 11 points and five assists, while Wassink tallied eight points and five rebounds. The Gusties won nearly ever statistical category in the contest gaining more rebounds, assists, steals, and turning the ball over less than the Eagles, but they shot a season low 31.3% from the field, and 1-17 from three-point range and that proved to be the difference in the contest.